In the world of blogging, moving forward is very important. For one, Internet technologies and techniques advance very quickly. If your blog’s design or code is aged in any way, it could prevent you from getting to the top. In this particular niche of blogging, however, there are so many new blogs coming out every day, so it’s important that you stay on top of the latest plugins, latest protocols, and the latest SEO techniques. To help you with this, I have compiled a list of a few things you can do to make sure your blog is always moving forward. One of the best things you can do is read other blogs that share valuable information. The first two that come to my mind are Basic Blog Tips and SEOmoz. Note that this isn’t an exhaustive list, but both Basic Blog Tips and SEOmoz have kept me up to speed on the latest social media changes, SEO techniques, powerful blogging plugins, etc. If you expect to get your blog moving at all, you have to look at the blogs that are already in the fast lane. 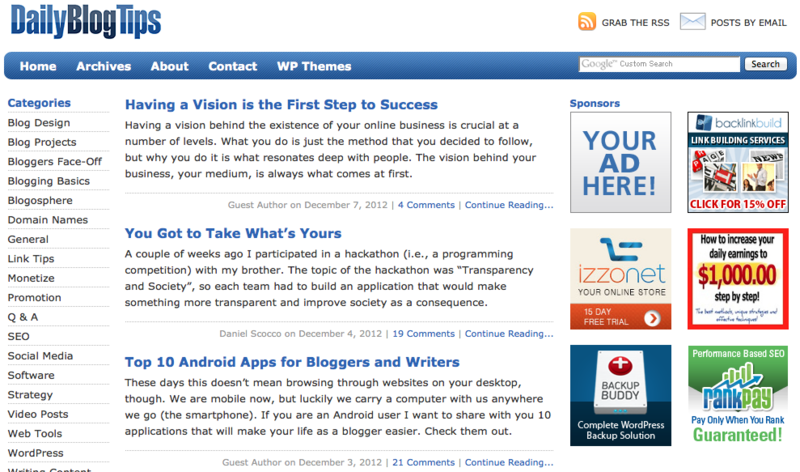 One of my favorite blogs, Daily Blog Tips, has a very outdated design. It looks like it was designed in 2005 and intended to be viewed on CRT monitor. The theme is very plain without any pictures on the homepage except for the advertisements on the side. When you click on a post, though, there aren’t any pictures there either. It just feels very bland and outdated to use the website. The best way you can keep your blog’s design up to date is to do a redesign once a year or so. I recently did a redesign here on Omega Web that switched my blog from a premium WordPress theme to the Genesis framework. I also included a mobile-responsive version of my site so that people using smartphones and smaller tablets will be able to read the content, comment, and share my posts without any troubles. When you’re doing a redesign, make sure you are moving forward and using the newest techniques in web design, such as a mobile-responsive version. One thing I cannot stress enough is to use the latest plugins. CommentLuv is the first one that comes to my mind when I think about plugins. In a nutshell, CommentLuv will provide your readers with an incentive to comment. It allows them to place a link to their latest blog post underneath the comment to share it with your community as well as gaining a backlink to their blog. CommentLuv is one of the most game-changing plugins out there because I tend to only comment on blogs that use it… So if you don’t use CommentLuv, you’re already falling behind! Some other great plugins to check out include Better WP Security, nRelate Related Content, W3 Total Cache, and Ad Injection. Every morning, I wake up and look at my Google Analytics, Google AdSense, affiliate earnings, Alexa rank, and other blog stats to see what has changed in the last 24 hours. This is very important because I use this data to improve my blog. If I find that the post on Google Author Rank was very popular, I might write a post called “How to Improve Google Author Rank” because I know that is what my readers want to see. Also, I always check things like Alexa to make sure my blog is improving and not going backwards. The biggest thing I can stress is to try and move forward every day. Even if you are just building a single backlink by leaving a comment at a blog, that’s still improving your blog better than it was the day before. Do something every day with the intent to strengthen your blog and you won’t get run over. Great ideas! I would specifically agree with #1, but also add that sharing up and coming information through timely posts would be a another way to keep things moving in the right direction. Thanks for sharing! Yeah. I think a new post every 3-4 days is a good schedule, especially if you’re on a network like Blog Engage or rely on social media for traffic. Superb, well covered all round and I agree that DBT’s design looks quite outdated, though it doesn’t look spammy without images. Are you saying that sites with images look spammy or that DBT is good at not using images and still not looking spammy? I don’t think Daily Blog Tips gets updated that much! If you will notice this guy is on the first page of Google for a lot of keywords and they all have that same design. I don’t know this for sure, but I follow him and he hasn’t written anything new that I’m aware of. He does still update Daily Blog Tips. Look at the dates on the posts; every few days there’s a new one. I’ve even guest posted there (PR 6 I believe). Content is great, design is not. I guess I haven’t seen any of his recent stuff yet! I’ll take a look again. To be honest, I’ve been so busy I haven’t checked his blog in a while. Thanks for the share, I agree that in the blogging world you can not afford to stand still. Also I had not yet heard about Google Author Rank, so I will have to check that post out next. Do check it out – it’s very important now that Google is using Author Rank to rank websites. Of cause you’re very right about redesigning your blog from time to time. You what they that change is constant and its only the wise ones that keeps up to change while the other people refuse to see it. I also agree with the issue of keeping up with the latest news in the industry as to know what happening. Every other thing you said here is correct. Hello again Ian, it was nice to read your post. You shown really nice points for blogging, the quotation you used in the beginning is awesome. Thanks! I do love that quote as well. I agree about daily blog tips. I find the advice there very good but the site itself does look a bit dated. I personally try to redesign my site every 1.5 to 2 years. I’d day more than 2 years is too long. About the plugins. I use to swear by the all in one seo plugin. That’s all I’d recommend for years but I recently started using WordPress SEO and haven’t looked back. I went about 7 months and then did my redesign. But my first theme was just a download from the Internet theme. This one I custom built, so I will use it a bit longer. But yeah, Daily Blog Tips is about 6 years overdue. Thanks for sharing this, After reading your article, I decided to make some design changes to my blog and it looks better than before. Another great authority blog is searchenginejournal.com. 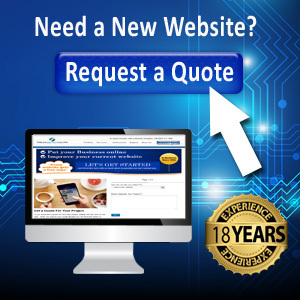 You will get up to date information related to technology , SEO and social media. BTW, I do agree that great design are misty for any new blog to succeed. I think I’ve been to that one before… Thanks for sharing! Yes, changes are very important. I think it makes the blog more livelier. I a visitor comes every day, and sees the same thing for years, it will feel like you didn’t moved forward anything at all. And I agree, blogs should be compatible with phone browsers. Very much agreed… Thanks for stopping by.